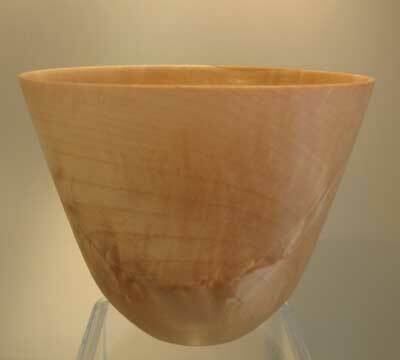 Last time we looked at how rims can affect the profile and 'feel' of a bowl, but I now wish to consider asymmetry and how it can be used in the design of edges; either by using a natural formation or by simple manipulation. In his book, Ceramic Form, Peter Lane speaks about how clay can be manipulated by cutting, shaping and rejoining the cut edges. 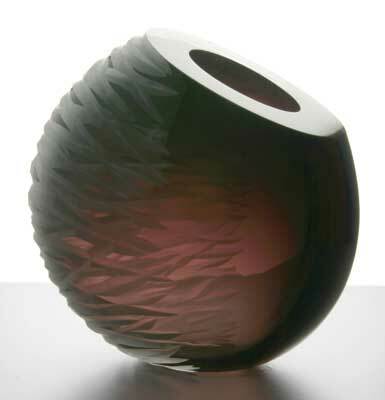 In the process, the rim is often radically altered and either left or cut down, forming a new horizontal line. He carves the rims of his porcelain bowls into flowing curves and peeks to suggest landscape horizon, as shown opposite, where the rim has a torn effect, thus giving rise to a 'natural' organic feeling. While clay offers the freedom to cut and reattach while still wet, this unfortunately is not available to the turner but we still have the opportunity to work on the rim of our bowls. This is especially relevant when considering the benefit of the wood's stability, unless of course we are working with green wood. Modern turners are now frequently seen cutting and deforming their work and Mark Hancock is renowned for this approach, as demonstrated below. Another benefit of using wood over clay arises when the edge is formed naturally by the bark. 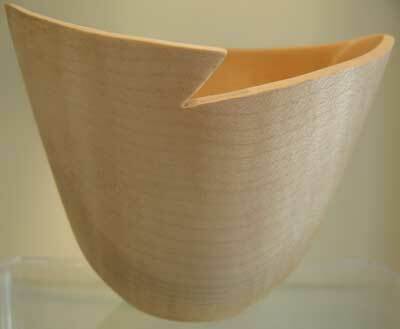 There is a difference between a bark-edged bowl and a natural-edge bowl; a natural-edge bowl has an edge which follows the contour of the log, independent of whether there is bark on that edge. 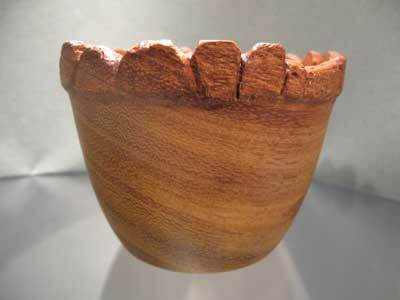 All bark-edged bowls are natural-edge bowls, but not all natural-edged bowls include bark! 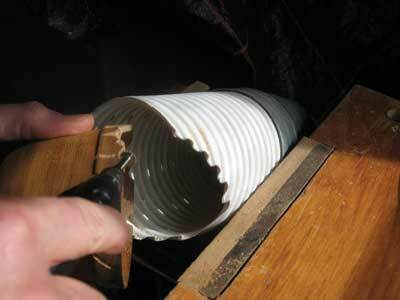 Successfully retaining a bark-edge depends on the species of wood being turned and when the tree was cut. 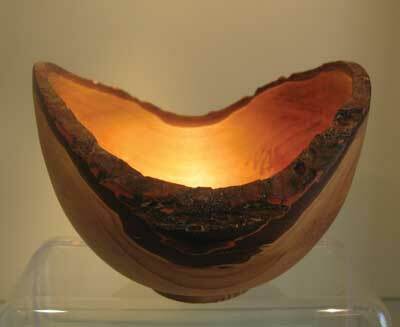 If trees are cut during the summer months they will often shed their bark as they dry, but bark edges can be simulated on a natural edge bowl using a variety of tools such as a pyrography iron, a blow-torch, a chainsaw or even a felt-tipped pen. 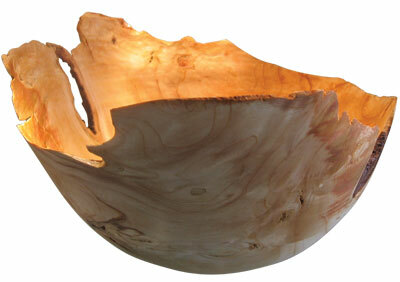 The features of a natural-edged bowl which give visual impact are its uneven edges, inclusions, bark characteristics, and the curve of the piece. The more there are, the more opportunity there is to take advantage of the natural-edged piece. 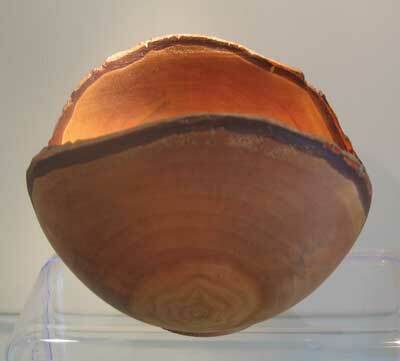 The simple bark-edge bowl, uses the saddle-shape produced by following the growth rings of the tree - here the full circumference retains the bark from the blank. Its symmetry dictates that we view it from this angle, where orientating the bark edge before turning produces peaks of different heights. 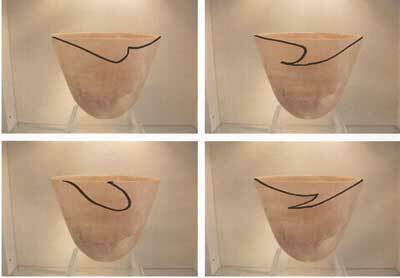 Richard Raffan discusses this phenomenon in Turning Bowls and in Bowl Design, advising that natural-edged bowls need to be symmetrical with the highest points of the rim at the same height and the lower points also in the same horizontal plane. Having set these restraints, he goes on to say that the most dramatic natural edge is produced in burrs and suggests the "...urge to retain the surface texture of a bowl is almost irresistible". Certainly there is something wonderful in the way the rough edge contains the smooth interior of the bowl, producing a dramatic contrast. So taking full advantage of our ability to 're-structure' rims, the only problem now is to decide what to do. If we start with a symmetrical bowl, we can change it into an asymmetrical form through mimicking other sources or by utilising an abstract idea. 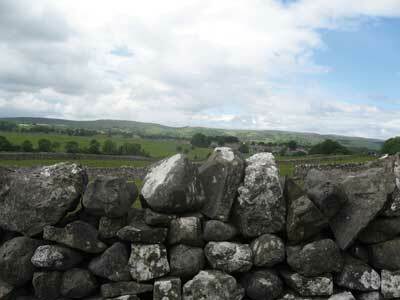 We'll be returning to source materials in a future article, but as a taster, I used a recent trip to the Yorkshire Dales where a dry stone wall, against the blue sky suggested a possible rim design for a simple bowl. Manipulation of the print on the computer produced a template to copy onto the bowl's rim. 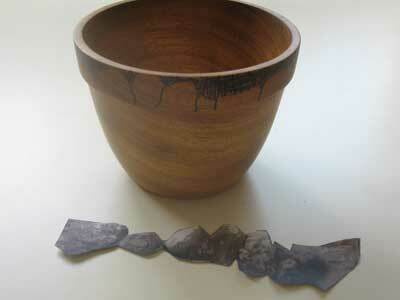 The use of saws and diamond burrs in my Dremel look-a-like produced the final bowl. 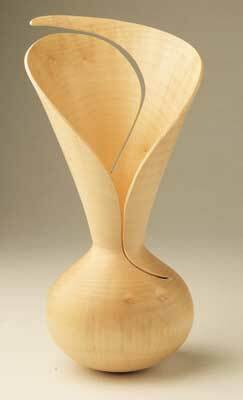 Although not perhaps the greatest piece of turning, it does show how inspiration from the natural world can be used to move on our designs. I could have chosen a symmetrical source such as the parapets of a castle for instance which would have given rise to a symmetrical rim. 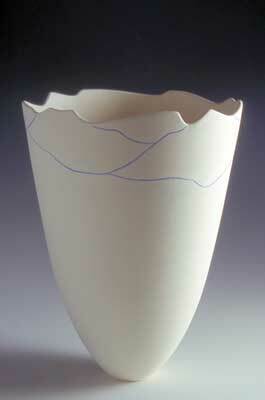 A similar project could be adapted from the cut lines of the clay pot. Here, again the computer can be called upon to provide copies of the profile of a simple parabolic bowl form, on which we can scribble to our heart's content before choosing a favourite 'best' line. With my choice made, a Dremel tool was used to cut out the shape before arriving at a final piece. So there are plenty of possibilities for experimentation with rims through the use of symmetry and asymmetry, natural and manipulated, regular and abstract. Keep an eye open for sources of inspiration and don't forget to keep a note of your ideas and observations. "Modern turners are now frequently seen cutting and deforming their work"